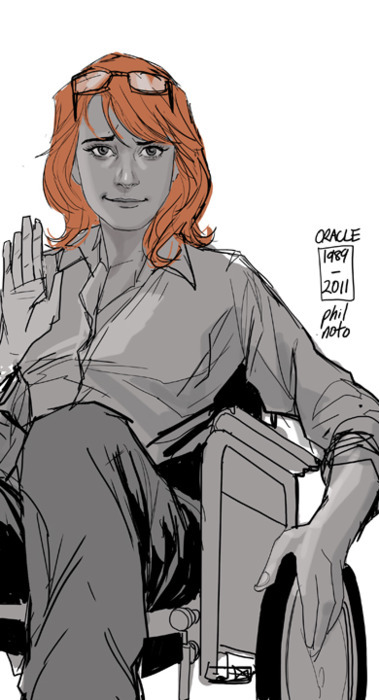 No stranger to the Art Appreciation Moment of the Day, today we have a wonderful piece by Phil Noto where he says goodbye to Oracle. Oracle 1989-2011 – My first job in comics was creating covers for DC’s Birds of Prey and and over the the course of 24 issues I drew this lovely lady a lot. And then I did some brief interior work on the Cassandra Cain Batgirl and finally did the first run of covers for the Stephanie Brown incarnation. They’ve all been great Batgirls much like Steed’s partners in the Avengers. I’ve done numerous pieces of Babs as Batgirl more so for the retro iconography and the aesthetic look of the black, yellow and red then her actual persona as Batgirl. Honestly in terms of fictional characters, I always just considered her to be Oracle. I, like many others, am very sad her to see her go, but if there’s anyone to keep her spirit alive as Batgirl once again, Gail Simone is the one to do it. Next Article DC RELAUNCH: History happens… NOW! That is a beautiful drawing! Nice work, Mr. Noto. 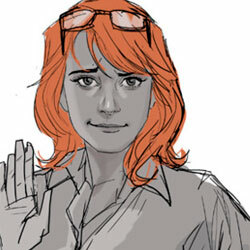 Phil Noto is an incredible artist. His Birds of Prey covers were absolutely gorgeous. Some of the finest covers I’ve seen in a long time. A fantastic drawing. The eyes and smile are incredible. She’s got that “don’t worry, I’ll be fine” look. Great drawing. Mr. Noto’s covers are some of my favorites from the BOP run. Nice work here too. The other person who seemed tossed aside but managed to sidestep it was Kyle Rayner. When they brought back Hal I got a, “we don’t need you anymore vibe.” Luckily he avoided that. I’ve trepidations about Barbara going back to being Batgirl but I’m on board since Gail is writing it. How very “Notoish”. The face is tight, but the body is sketchy. I had Noto do a sketch for me at the KC Planet con a 2-3 years ago and he took a pen and started drawing. Most artists begin with a pencil and get what they want, then will ink over the pencils. Noto has put out some great covers.